Dotbuster 3.5/5 The verdict is that this is a coarse jewel waiting to be polished so that the facets are cleaner and shinier. The game can be fun but it just needs some decent sessions where you give it a chance. The simple things in life are the most enjoyable, and especially the ones which remind you of your childhood. Do you remember when you were young and you had to connect the dots to create the pictures? 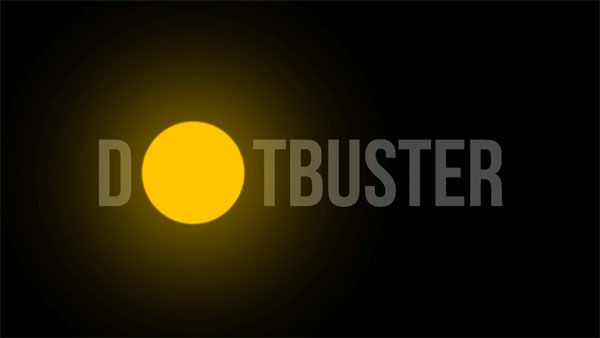 Dotbuster has that initial vibe about it… except that its amped up on steroids. 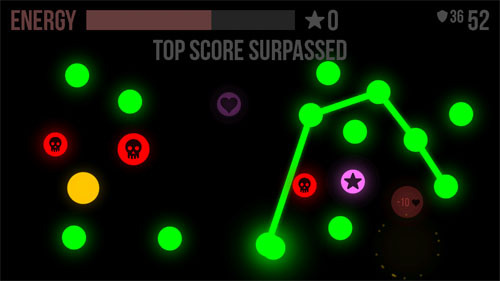 Small green circles appear on the screen and a simple swipe of the finger will connect the points together. Once you connect all the way back to the starting point then your polygon will be complete and the circles will disappear. Its very intuitive and actually if there’s nothing else on the screen then you’re naturally going to press on the green dots like childsplay. Quite literally there doesn’t appear to be much else that appears on the screen because of the minimalist stylisation. 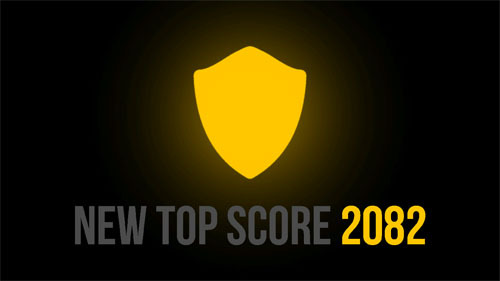 You may find on initial gameplays that you’re tempted to connect to all the points that appear on the screen in order, much like a whack-a-mole type game (except its connect-a-snake instead). But actually this isn’t allowed because as soon as you cross your own path then you’ll cancel the polygon you were drawing and you’ll have to start again. If instead you leave the dots, then you may find yourself asking which dots to connect first – there’s no numbers like those old skool connect the dot travel companions. But after you retrain your thoughts then you’re ready to rock and roll with the other specialities in the game. Leaving the dots is a no-no because they’ll swell up and turn amber in preparation to explode and drain your energy. This life gauge is the competition element which prevents you from continuing forever. But don’t worry there are boosters which appear as vibrant pink dots with hearts in them. If you encircle these within your shapes then you’ll collect them. Unfortunately if the red skulls viruses are encapsulated too then you’ll find yourself poisoning yourself. 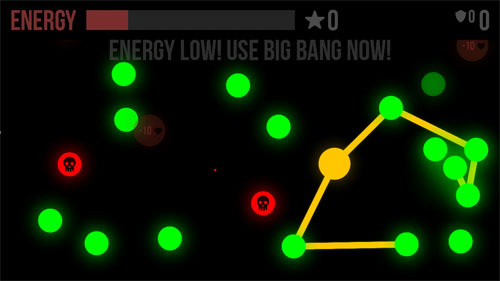 Death is inevitable with these survival games and as you progress then you’ll find that more red dots appear and your greens turn amber much faster. No sooner than you started then you’ll find yourself weighing up whether you’ll lose more from letting the dots pop, or if enveloping the skulls would reduce your energy less. Luckily there are some cogs which will clear the screen so you’re reset back to zero. Otherwise if you’ve collected enough stars then you can trigger a big bang which will obliterate everything on the screen. I have to be honest, first impressions of this game can easily lose people’s attention. Perhaps the biggest question that pops up is… why play this? It took me a long time to figure out why there was this niggling feeling in the back of my mind. But I realised that my problem was that this had deep connotations with my childhood of scribbling on random bits of paper. Indeed that’s a waste of time, but as long as I gave this game a chance then I realised that this game could be a winner. At the moment it’s a bit unforgiving for the newbies, but if players stick it out and start feeling that competition spirit then they’ll enjoy playing the game more. The verdict is that this is a coarse jewel waiting to be polished so that the facets are cleaner and shinier. With a little bit more pattern play and slightly less randomness I’m sure people will start craving for more Dotbuster. Don’t let the Google+ logins and In app purchasing put you off – the game can be fun but it just needs some decent sessions where you give it a chance.